This year’s exhibition, while responding to the general call for frugality, provides an opportunity to assess the varied and imaginative ways that students answer the call for an architecture that at once continues the fundamental traditions of drawing and design that have always marked out the school for distinction while seeking to confront the rapidly changing conditions of theory and practice. For, beyond any immediate economic exigency, architects are faced with the need to re-think their strategies in the light of the urgent questions raised by increasing scarcities—of shelter, food, water and energy. Many of these issues have to be seen in a holistic and global frame of reference and, of course, not all of them can to be solved by architecture. But architecture, envisaged at its most expanded scale, as well at its most intimate, can and should take these problems into account, and define precisely where it might intervene in order to ameliorate or moderate, and certainly not exacerbate them. It has often been said that the global and the local are fundamentally interrelated. Indeed a global frame of reference demands a specifically local response; the universalizing tendencies of the past, inherited from the Enlightenment, do not always work effectively in a local context; so the global frame implies a new look at the local frame, and all the scales and operative frames in between. The First Year studios, while introducing new students of architecture to the formal, arterial, and programmatic principles of architectonics, operate as research laboratories in form and space, with students working in groups investigating the parameters of visual perception, light, orientation, inhabitation and structure, The Second Year explored the ramifications of advanced topological design in a creative three-dimensional extrusion of the classic Cooper Union “Nine-Square-Grid” problem, and went on to study the complex implications of entry: their “doors” revealed all the exciting (and problematic) possibilities of the interstitial space of passage through a wall—the first step into inside space from outside. The Third Year Comprehensive studio immersed itself in the analysis of the inter-relations among the myriad components of architecture, from regulations, to program, structure, building and environmental technologies, ending the year with proposals for an elementary charter school in Harlem. This proved an exciting program that engaged the students in a creative field of social, educational, and spatial relations. Fourth Year began with a large-scale study of the suburban environment, bringing together the insights of landscape architecture, urban renewal, and ecological analysis in order to propose varied responses to the continuing, and escalating, problems of suburbia. The year continued with the examination of civic space within the urban fabric in relation to the idea of the “Templum” in the contemporary city. The Fifth Year Thesis is a full year research and design studio that allows each student to indentify a problem field—local or global— considered especially susceptible to architectural intervention at different scales. Studies ranged from the challenge of declining agricultural production and aquifer exhaustion in the Mid-West to the construction of “memory theaters” in the context of Australia’s checkered history with its indigenous populations, the potential of landscape ideas to transform urban re-formulation, the research into new materials and spatial techniques for going beyond orthodox geometrical design, the crisis of the growing “informal” cities of the favelas, to finding ways through drawing in which philosophical thought might be explored in its three-dimensional implications. The Graduate studio looked at the structure and form of urban regions in order to draw out their environmental and programmatic potentials, followed by a study of large scale landscapes and their possibilities considered as architectures of nature. The Graduate students will complete their program following the development of their individual theses projects this summer. It was no accident that, receiving this essay from Focillon in 1943, Le Corbusier was inspired to design the Open Hand for Chandigarh. 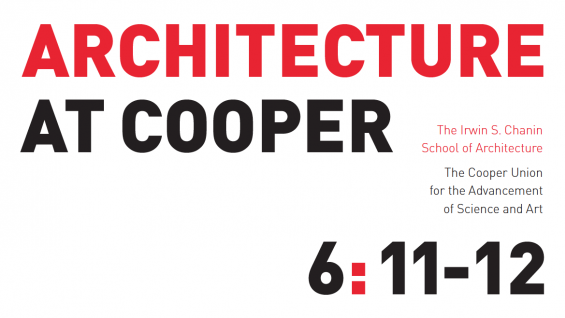 It is also the sentiment that has guided and enabled the practice of an especially unique architectural education at Cooper. The second theme would be that given by Peter Cooper, his demand that the central purpose of the Union would be to create the conditions for the education and uplift of a citizenry, free to think and create, debate and disagree, in the context of an always-evolving democracy. The role of architecture in this debate has taken many forms over the last half-century, but the dynamic interaction of inventing and making, conceiving and constructing, remains its task and its challenge in a world increasingly divided, in economic wealth, resources, and ideologies.